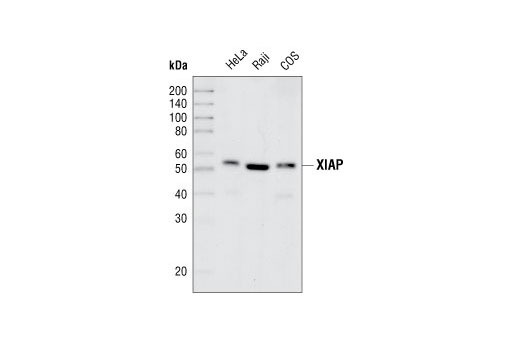 Western blot analysis of extracts from HeLa, Raji and COS cell lines, using XIAP (3B6) Rabbit mAb. XIAP (3B6) Rabbit mAb detects endogenous levels of XIAP. No cross reactivity was observed with other IAP family members. Monoclonal antibody is produced by immunizing animals with a synthetic peptide corresponding to a region surrounding serine 245 of human XIAP.